Please visit the photo albums for an album of�1239 First Street pictures. 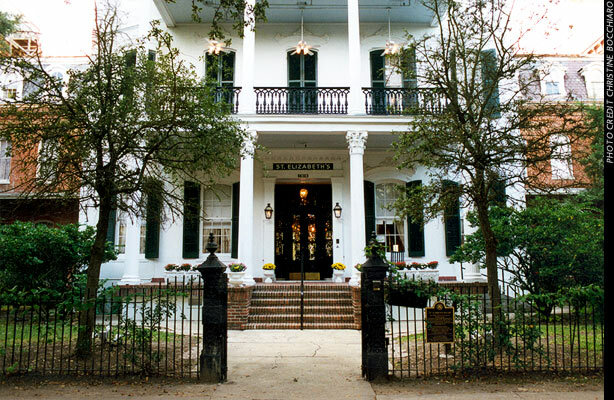 This house is also the inspiration for Mayfair Manor, the Garden District home of Anne's Mayfair Witches. Pictured here are the swimming pool and the side porch. Both of these locations figure prominently in Mayfair Family history. In Anne's Mayfair Family, the swimming pool in the backyard garden was installed by Stella Mayfair in the wild years of her youth. 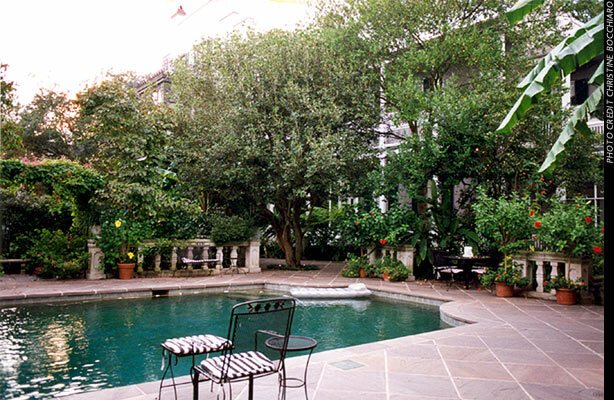 It is the pool that Michael Curry is found floating in on Christmas morning, 1989, after suffering a heart attack while fighting Lasher. Deirdre Mayfair sits on the side porch in silence for over thirty years, refusing to speak so as not to allow Lasher to enter her thoughts. During this time, Lasher is often seen standing beside her rocking chair, whispering into her ear. 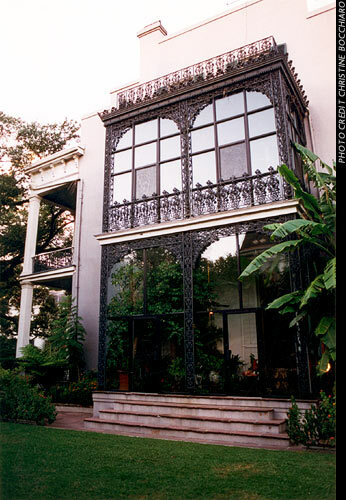 The side porch is two stories high with very ornate cast iron decorations. It fronts on two attic windows on the third story of the house. Ancient Evelyn, when she was a young girl, paid secret visits to Uncle Julien by climbing this iron balcony to the second story. Antha Mayfair climbed through one of the attic windows onto the porch roof, where she jumped to her death rather than become part of the Mayfair legacy. Behind those windows, Carlotta Mayfair poisoned private investigator Stewart Townsend, and then wrapped his body in a rug bound with chains, and stored him in the attic for fifty years to be discovered by the engaged Rowan and Michael. Michael also throws Lasher, in a Taltos body, from one of these windows to his death on the flagstones below. 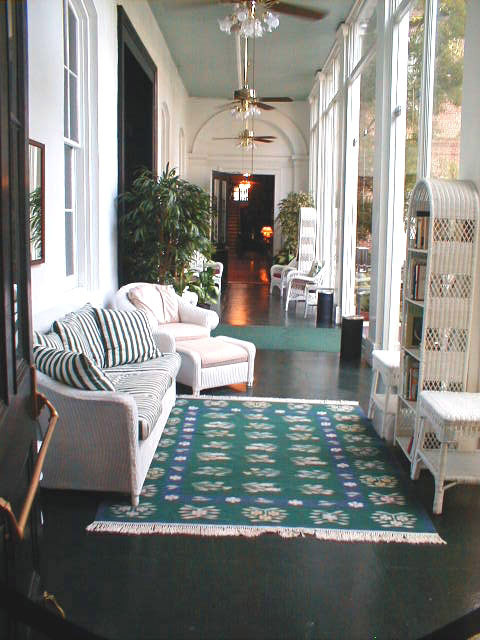 The photos on this page are from the time Anne owned St. Elizabeth's, which has since been sold. Click to enlarge. Please visit the photo albums for�an album of�St. Elizabeth's�pictures. St. Elizabeth's has been sold. The restoration will continue and the building will be converted to wonderful condominium residences. 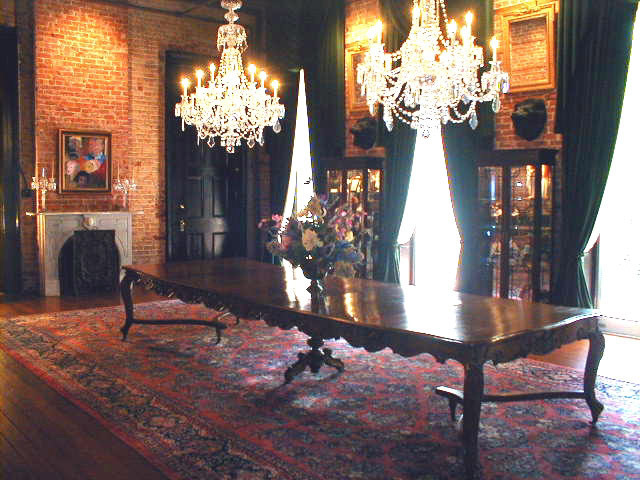 The Corinthian columns of the front porch guard a wonderland of rough and ready elegance -- bare brick walls, gorgeous draperies, mirrors, burgundy carpet, shining heart pine floors and crystal chandeliers. At the time of Mrs. Rice's ownership, bedrooms included the snazzy and huge Sunset Boulevard room with its two queen size beds, the stylish Miami Beach room, and the gracious Victorian room. 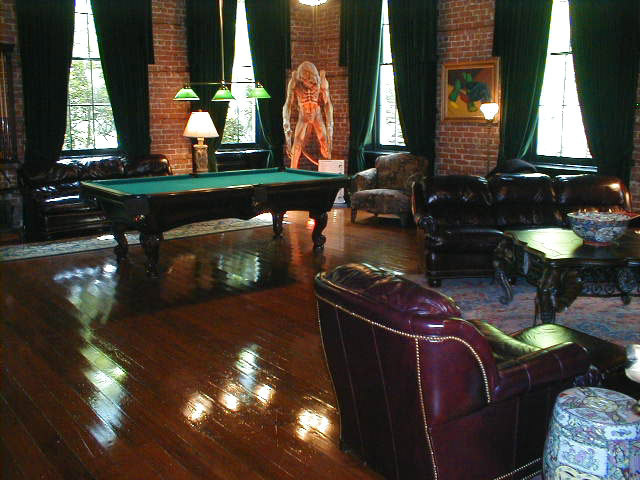 Huge drawing rooms -- the game room with its leather furnishings and reproduction juke box, and pool table -- the green ballroom with its many mirrors and majestic velvet draperies -- and the dining room with its bold antique table and sideboard -- lead to the upstairs and the magnificent two-story chapel, with fully restored plaster ceilings and walls, and the original stained glass windows. 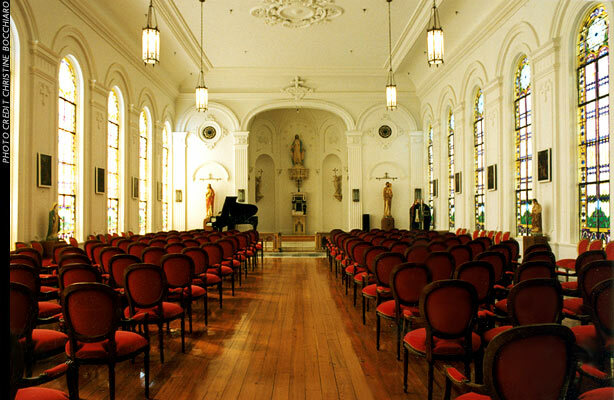 The chapel seats 225 for recitals or concerts or what you will. Acoustics are incredible. 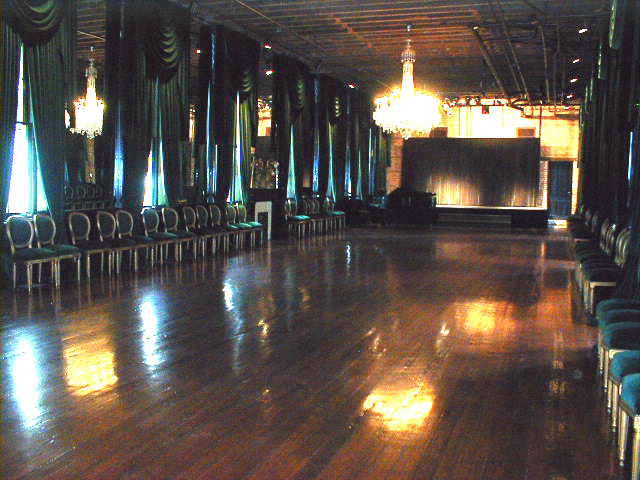 And the chairs can be cleared away to reveal a wonderful wooden dance floor. 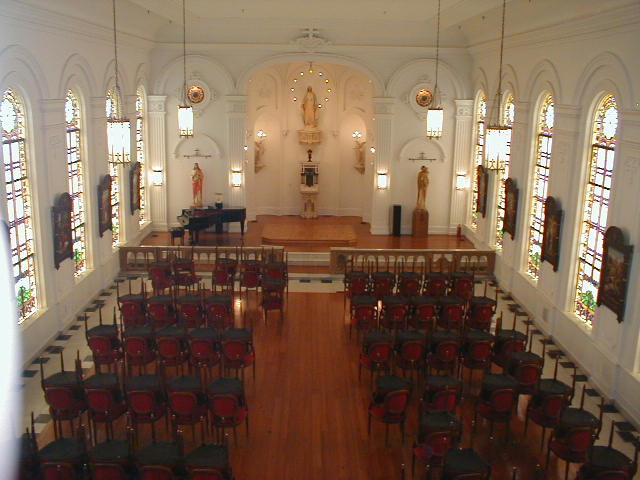 St. Elizabeth's has been the site of many memorable parties, weddings, and events. It has hosted the National Mayors Conferece, and was visited by President Clinton. Tours of St. Elizabeth's are no longer possible. The information provided below is an historical look into the property as it was maintained by the Rices. The St. Elizabeth's pictures are now downloadable as large size JPEGs, with superior resolution and clarity. Click on individual pictures to have a look! The descriptions have also been updated. There's also a downloadable QTVR of the magnificent White Chapel. St. Elizabeth's was built as a boarding school in 1865 and later turned into an orphanage for girls in 1870. The Daughter's of Charity closed the school in 1989 and moved the program to Marrero, where they already operated a similar program for boys. 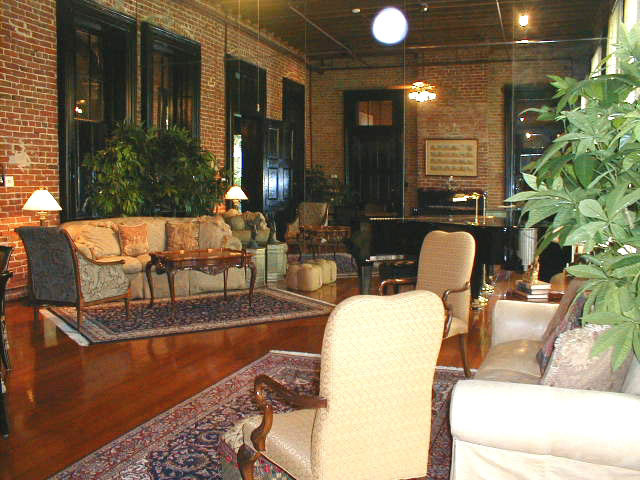 The place was put on the market and almost became upscale apartments and senior citizen housing before Anne bought it in 1993. St. Elizabeth's is an immense three-story brick edifice of 55,000 square feet. 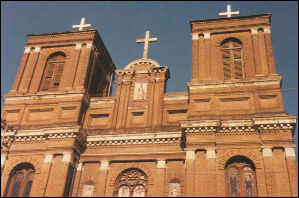 The three buildings that comprise St. Elizabeth's are the largest cluster of Second Empire design architecture in the city of New Orleans and are on the National Register of Historic Places. 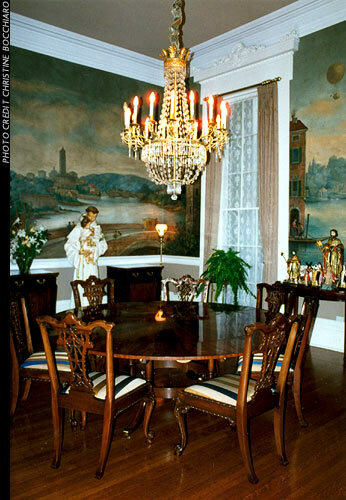 The entire house was decorated by the Rice Family and bears many of their personal touches, antiques and artwork, such as the St. Elizabeth statue and the old Victrola record player in the foyer. "Usually Americans have to go to Europe to obtain an old villa, palazzo or chateau," Rice said in a press release announcing the purchase. "We have found one right here in one of the most beautiful cities in America. And all our plans are in complete harmony with the lovely work of the architects who built St. Elizabeth's Home." The large library and chess room holds Anne's extensive collection of books (ranging in subjects from menopause to Biblical history) and an engraved and inlaid chess set. One of Stan's many paintings hangs over the mantle. 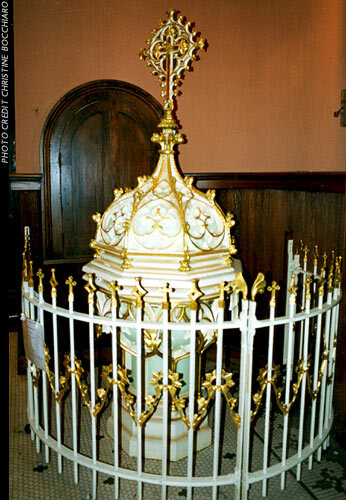 It was the white chapel at St. Elizabeth's that particulary captivated Anne. Its brilliant stained glass windows fill the church with subtly tinted light. 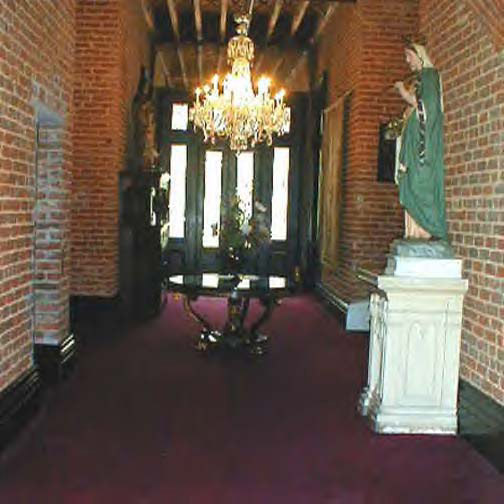 The former altar and the side aisles remain adorned with Roman Catholic religious statues and figurines, part of Anne's extensive collection. To have a closer look, download the�White Chapel QTVR movie�(527K), which is a navigable, 3-D, 150 degree look from the center aisle. You'll need the QTVR Player from Apple (http://qtvr.quicktime.apple.com/) to run it on either a Mac or a PC. The "Burgundy Guest Suite" is one of the many rooms in St. Elizabeth's set aside for visitors, friends, and family. The importance of family to Anne is well-known, but perhaps not as well-known is her generosity and her role in bringing her own extended family together. Anne's residence on First Street and St. Elizabeth's have served as homes for other relatives, gathering places for family events, and repositories of family history. 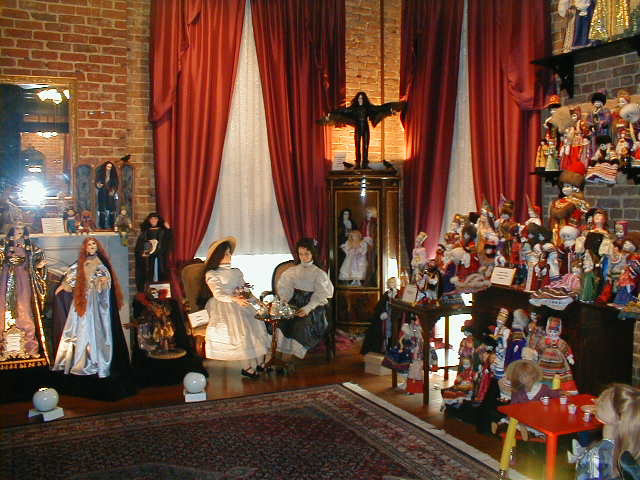 Part of one wing of St. Elizabeth's houses Anne's extensive doll collection. A collector for nearly twenty years, Anne has dolls from all over the world, including works by many of the greatest doll craftpersons, one-of-a-kinds, and commissioned works. The collection comprises over 800 individual pieces. 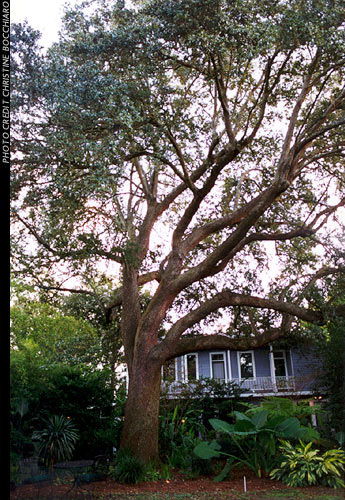 PLEASE NOTE: These pictures have been provided for the personal enjoyment of visitors to the Official Anne Rice Web Site. Please do not reproduce or distribute them in any manner without written permission. Direct any questions to�the Webmaster. Please visit the photo albums for�an album of St.�Alphonsus�pictures�or see the beauty in�video on YouTube. 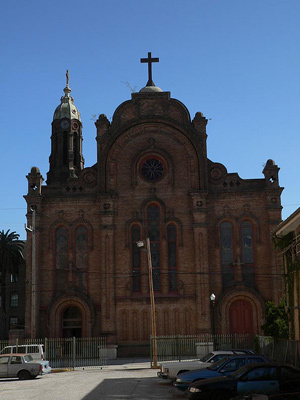 St. Alphonsus�was Anne Rice's childhood parish. She was baptized in that church, attended school there, and part of the parish family until it was merged with St. Mary's across the street. Today, St. Alphonsus is under the direction of The Friends of St. Alphonsus, Inc., a grass-roots organization dedicated to the preservation and restoration of the former St. Alphonsus Catholic Church now known as the St. Alphonsus Art and Cultural Center. The Friends of St. Alphonsus currently run a variety of programs from the St. Alphonsus Art and Cultural Center, including art tours, concerts, genealogical programs, and tours of its museum of religious and historical objects. 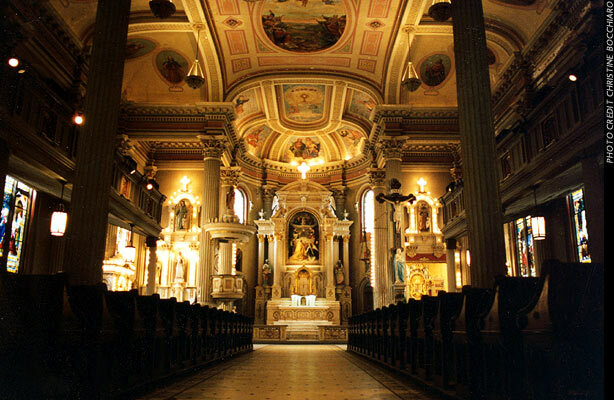 St. Alphonsus is well-known for its art and architecture. The frescoes and stained glass windows of St. Alphonsus are some of the most beautiful in the nation. 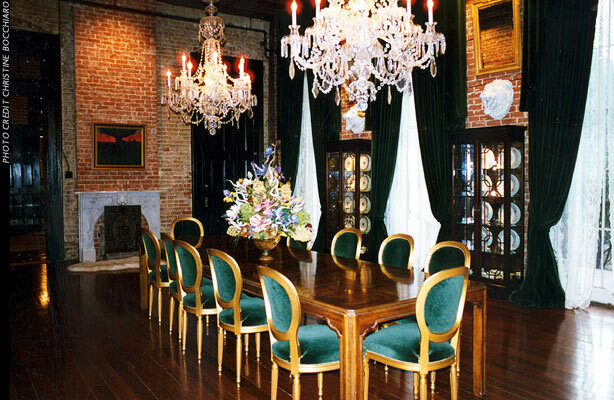 To arrange private tours or rental of the St. Alphonsus Art and Cultural Center, call 504-524-8116. 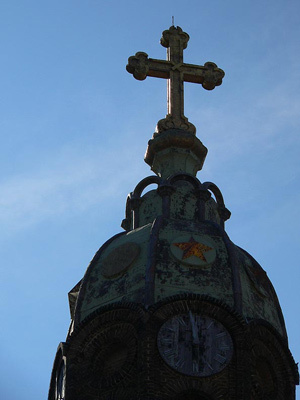 For more information and a visual tour of this magnificent and historic architectural treasure, visit the�Friends of St. Alphonsus web site. 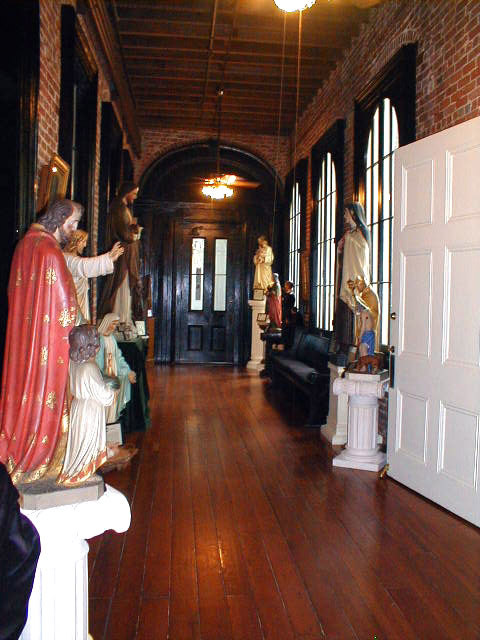 History St. Alphonsus, located at 2045 Constance Street, was originally built in 1855 by the Redemptorist Fathers to serve the religious and social needs of the Irish Catholic immigrants who began settling an area upriver from the French Quarter known as Lafayette City in the 1840s. It was one of a number of buildings forming a religious complex that once occupied five adjacent city blocks. Often referred to as "Ecclesiastical Square", the complex included an orphanage, nine school buildings, a gymnasium, three churches, the priests' residence and gardens, two convents, stables, a laundry and other supporting buildings. Pray the Angelus Three Times a Day! 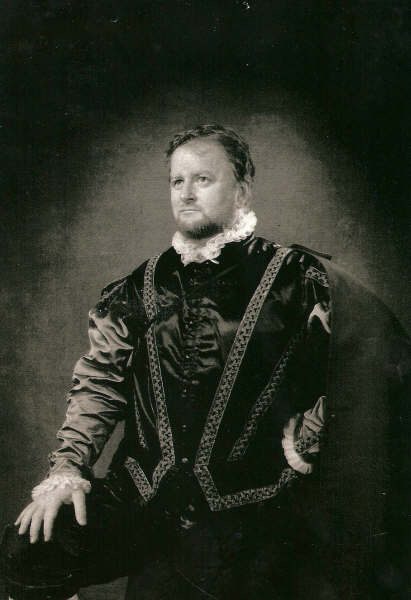 Gerald Stroup, tenor, has performed with the Goldovsky Opera Workshop,�New York Grand Opera in Central Park, and the New Orleans Opera just�to name a few.� A featured soloist in both Oratorio and Recital�Literature, he has performed extensively in both fields. Handel's�"Messiah", Orffs "Carmina Burana" Rosinni's�"Stabat Mater"�and�"Missa�Solemnis" by Beethoven�are examples of his Oratorio performances with�various Oratorio and concert groups. Mr. Stroup has performed with the�Baltimore Symphony, Houston Symphony, Columbus, OH, Symphony and the�Louisiana Philharmonic. He has performed in New Zealand as featured�artist of the Bay of Islands Festival of the Arts, in Kerikeri. Mr.�Stroup has appeared in recital in St. Louis at Christ Church�Cathedral, and lectured and conducted Master Classes in Western�Kentucky University in Bowling Green. He had the honor of performing�with jazz legend Dave Brubeck at the New Orleans Jazz Festival. Mr. Stroup sang the role of the priest in Mr. Brubeck's inspirational composition of Mass: To Hope. He has appeared on programs with Mr.Bill Cosby and Montel Williams. 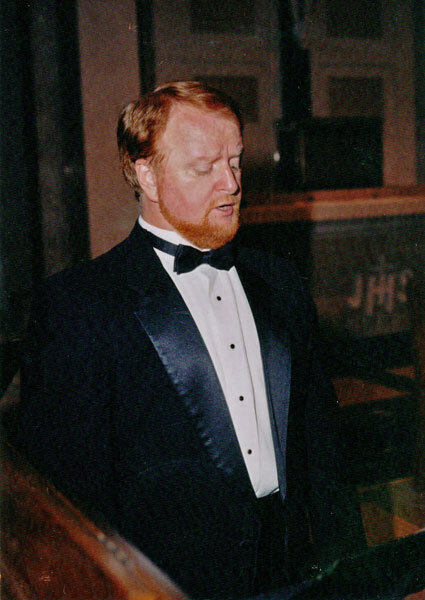 Mr. Stroup has sung the tenor soloswith the Louisiana Philharmonic's performance of Handel's Messiah.Mr. Stroup has performed�recently as�tenor soloist�with the San DiegoFestival Chorus presentations of "Carmina Burana" and "The Mass forSt. 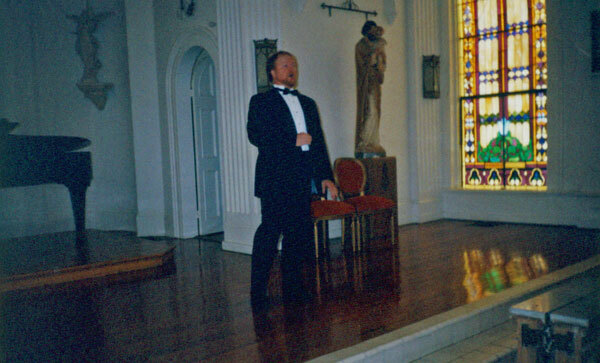 Cecelia under the the direction of Maestro Anthony Mostardo.�He ison the soundtrack of the New York Films Festival movie "Under Hellgate�Bridge" singing�Ave Maria by Schubert.�He has also sung recitals and�concerts at St. Elizabeth’s, as seen in�Anne's New Orleans: St.�Elizabeth's.�Mr. Stroup was visiting artist at Western KentuckyUniversity for the 2007-2008�academic year. He is currently teachingat Tulane University and Loyola University in New Orleans. This yearhe will perform the tenor solo in the "Gloria" by Giacomo�Puccini. St. Mary's Church, the setting for Rowan's wedding in THE WITCHING HOUR and Aunt Queen's funeral in BLOOD CANTICLE, is in need of financial assistance to complete the restoration of the church following Hurricane Katrina. Fr. Greg Schmitt, Pastor of St. Mary's, is in the process of having the roof replaced. 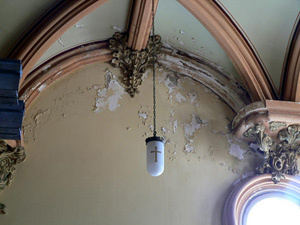 There was extensive plaster damage to the walls and ceiling, the interior of the church must be painted, the exterior of the church must be cleaned and sealed. St. Mary's needs a new sound system, the organ needs to be repaired, and some stained glass windows need to be replaced just to name a few things on the long list of repairs. Any donation would be greatly appreciated. 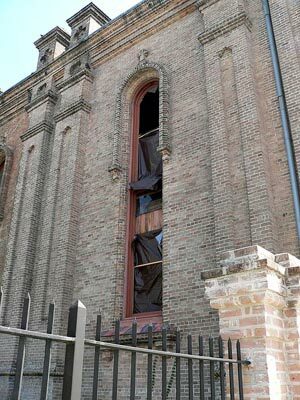 Donations can be made payable to St. Mary's Church Restoration Fund, 2030 Constance Street, New Orleans, LA 70130. The front of St. Mary's Assumption in New Orleans. The St. Mary's Bell Tower. Note the damage and the missing star on the left. 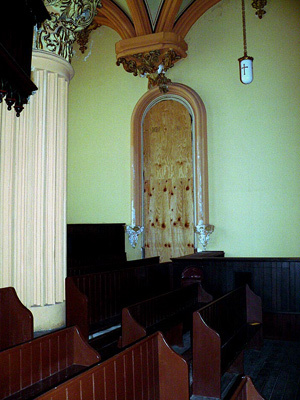 It is believed that the star flew off and destroyed one of the stained glass windows. Stained glass window destroyed by Katrina. 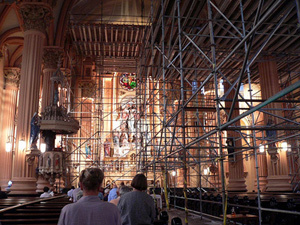 Scaffolding dominates the interior of the church, but Mass is still being said and parishoners pray.